At Smart Choice Heating & Cooling, Inc., we recognize the stress and aggravation of air conditioning malfunctions. No one wants to call for a repair. Every homeowner worries about time, cost, and quality of work. As the only Factory Authorized Dealer providing service in Vancouver, WA, Camas, Ridgefield & Brush Prarie, we are uniquely qualified to handle the most complex problems, and continually prove our commitment to superior performance. Recognition as a Bryant Factory Authorized Dealer is earned, rather than given. The team from Smart Choice Heating & Cooling, Inc. continues factory training, staying current with product development and technical advancements. We sustain exceptional standards of business practices, customer dedication, and industry leadership. When you trust us to handle your concerns, we not only address the most pressing problems, but verify the safe, efficient, and reliable operation of the cooling system as a whole. 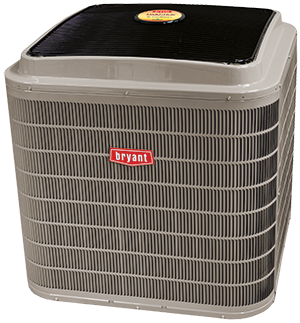 Your central air conditioning system relies on each component operating at peak capacity. The system requires a great deal of air transfer. It moves heat from inside your home to the outside and blows cool air into your home by extracting heat out of the air. The air is cooled as it flows over an evaporator coil, which is filled with refrigerant. As the refrigerant absorbs heat, it changes from liquid to gas. A compressor pump, which is run by a motor, is used to move the refrigerant between the evaporator coil and outside condenser coil, where it converts back into liquid. While this is a simplified version of how your cooling system works, it indicates how each component depends on the proper operation of the others. Restricted airflow, too much or too little refrigerant, misaligned belts, and friction in the motors are all little problems, which could quickly set off a domino effect and damage the entire system. When you notice even a minor disruption in performance, don’t put off calling for professional service. Musty smells can be a sign of mold or mildew. These contaminants restrict airflow, block coils, and pose a serious health concern. While you might be tempted to live with a slight, unpleasant odor, consider that airborne spores can be sprayed directly into your breathing air every time cooling is activated. Allergies, asthma, and respiratory infections have all been linked to contaminated cooling systems. You’ll also pay higher energy bills as the system struggles to answer thermostat settings. Screeching and grinding sounds, temperature swings, inferior cooling, elevated humidity, and excess dust in the air are all indications of faults within the system. When handled quickly, these issues can be resolved with simple and cost-effective adjustment, cleaning, and tuning. The licensed technicians from Smart Choice Heating & Cooling, Inc. will ensure a clean, healthy, and reliably cool home for you to enjoy. FOR THE SAFEST AND MOST RELIABLE AIR CONDITIONING REPAIRS AROUND, CONTACT OUR TEAM TODAY! Repairs from Smart Choice Heating & Cooling, Inc. ensures a job done right the first time. Our NATE-certified technicians have the in-field experience, factory training, and sophisticated tools to accurately diagnose and resolve the most difficult challenges. We rely on Factory Authorized Parts when replacement is needed, guaranteeing superior efficiency and durability. As a small, family owned business, we are very proud of the lasting relationship we’ve built with our customers. Each project we take on is of the utmost importance, and we focus our full attention and extensive resources on a quick and satisfying completion. When your safety, comfort, and budget is at stake, don’t trust anything less than the most qualified team in the Vancouver area. Call Smart Choice Heating & Cooling, Inc., and get the help you need.